Investing in real estate has often been viewed as the poor second cousin to the stock and bond markets. The misperception that investing in real estate is somehow difficult has cost Canadians the opportunity to increase both the quality of and income from their investment portfolio. To help provide a new perspective to Canadian investors, Canada's bestselling real estate author speaks about his relationship with real estate as the asset that has consistently delivered value for himself and the Real Estate Investment Network community across the country. People want to learn from the best. Investors have no better role model than Don R. Campbell—either to be introduced to the world of real estate or to take away lessons that will embolden success. 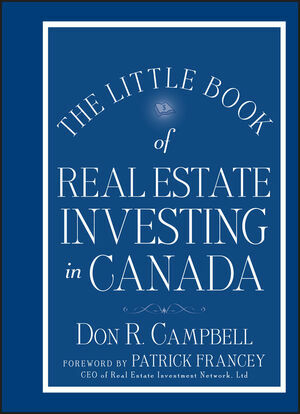 DON R. CAMPBELL (Vancouver) is a Founding Partner and Senior Analyst of Real Estate Investment Network Ltd. He is a leader in providing Canada's most current real estate investment education programs and economic research reports and analysis, and is the author of the best-selling Real Estate Investing in Canada 2.0 and co-author of 97 Tips for Canadian Real Estate Investors; Real Estate Joint Ventures; and Secrets of the Canadian Real Estate Cycle.